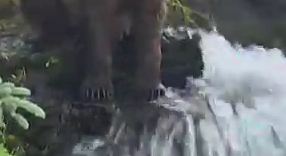 In recent weeks, I've spent hours watching leaping salmon and the bears that stalk them. It's been fantastic - a rare privilege, with likely a better view than I'd get from being there in person! I had no idea that a salmon run could be so abundant. 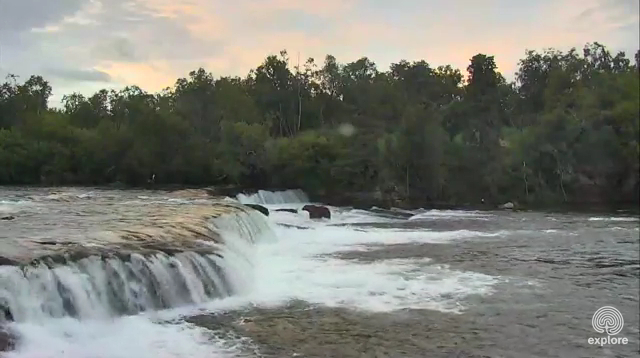 The camera's been running continuously for nearly six weeks now, with salmon leaping all the time, day and night. I had no idea how high they had to leap, either - it's absolutely astonishing. 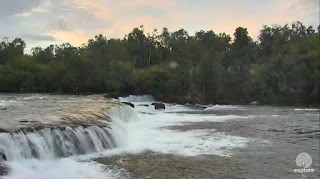 The bears at Brooks Falls - I think there's 7 in this picture. I've also come to value having an opposable thumb! 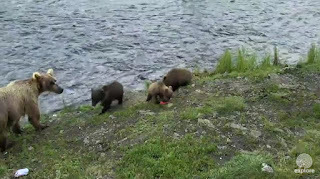 Lacking one, the bears can't eat their catch in situ: they have to walk off to a suitable rock where they can pin their flapping catch with a paw whilst filleting it with their teeth. And filleting is all they bother with - the salmon are so abundant that further dismemberment isn't worth the effort. The rest of the carcass is discarded for the gulls and other scavengers to find. I heard once that some people believe these phenomenally-abundant salmon runs are what made the Pacific Northwest so much more fertile than geologically-similar Australia: all those salmon bringing protein and minerals from the sea to the land. They may lack opposable thumbs, but they have pretty impressive claws! There's a family of three cubs - although one is a lot smaller than the other two, so I fear it'll be a family of two cubs before too long. The other day we were watching two of them smooching with each other, which was very cute. The bigger ones are starting to catch their own salmon now, although it'll be a while before they're as good as mum! Check out the webcam here. The stream is coming from Alaska, which is 20 hours behind New Zealand time (i.e. 3pm here on Tuesday is 7pm there on the preceding Monday). Sunset there is currently around 11pm (7pm NZ time), after which the camera goes to black and white with poor resolution, although the salmon don't stop! The sun sets slowly so far north which often makes for a gently beautiful display. Yesterday's sunset. In the middle you can see the cubs' mum - still out fishing for them late into the night. The salmon you'll see are chinook salmon (also called king salmon) and the bears are brown bears. 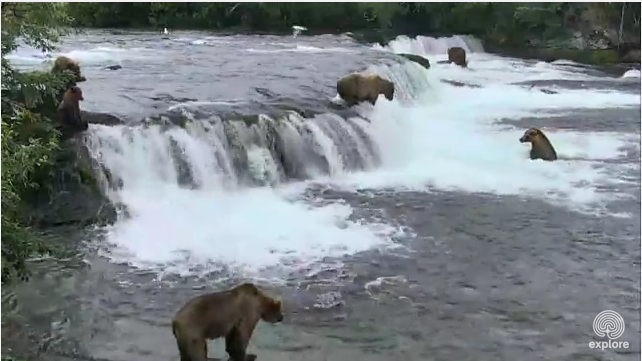 The feed is streaming from Brooks Falls in Katmai National Park and Preserve (at the base of the Alaska Peninsula - the tongue of land that ends in the Aleutian Islands). The webcam has been made possible this year by a special one-off $150,000 grant. Maybe they'll crowd fund it next year? I've had hours of pleasure watching it and would gladly contribute towards it running again next year.